CPR was performed on a toddler who died in a pool accident. An 18-month old boy died after falling into a backyard swimming pool in North Vancouver. The toddler was initially reported missing from a home on Fairway Place in Deep Cove but the first Mountie to arrive on scene found the infant underwater. The officer, an Integrated Police Dog Service member, dove in and pulled the child from the pool and performed CPR until the arrival of the paramedics. The boy was quickly transported to Lions Gate Hospital but could not be revived. According to Cpl. Richard De Jong, despite the heroic efforts of emergency personnel, the child could not be resuscitated. The North Vancouver RCMP extends their deepest condolences to the parents and family of the child. The immediate delivery of cardiopulmonary resuscitation (CPR) can save a life. 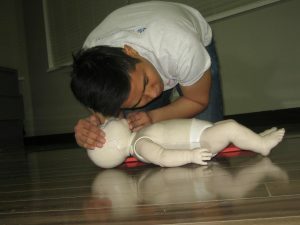 You can learn this life-saving technique by enrolling in a first aid course today.